I am pleased to announce another new design, published for free in PopKnits Issue # 05, Fall/Winter 2009 (Ravelry link). It was such a pleasure for me to work with Stephanie Pajonas at PopKnits to publish this pattern! 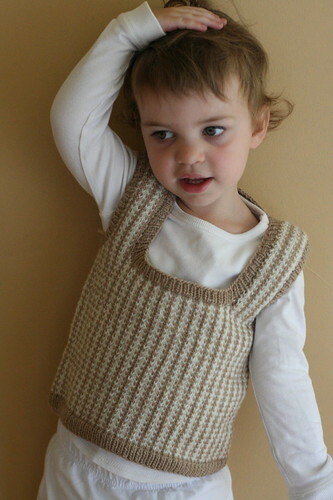 This child-size, stranded vest employs a vintage houndstooth pattern with a low scoopneck. The houndstooth is framed by 1×1 rib at the bottom edge, neck edge, and armholes. Although I designed this as a small scale way to practice steeking neck openings and armholes, it plays a very functional role in a child’s wardrobe. 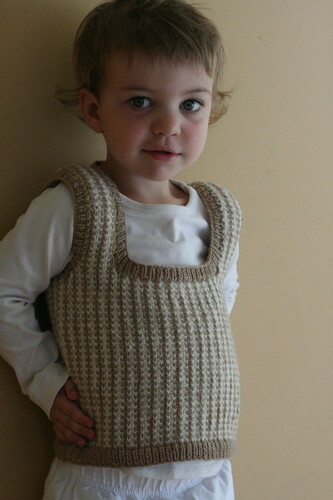 A scoopneck vest offers the promise of warmth without the headache of sleeves, buttons, or constricting neck openings. It is the ideal layering piece for a child. Beatrix wanted to wear this as soon as I finished it in June. 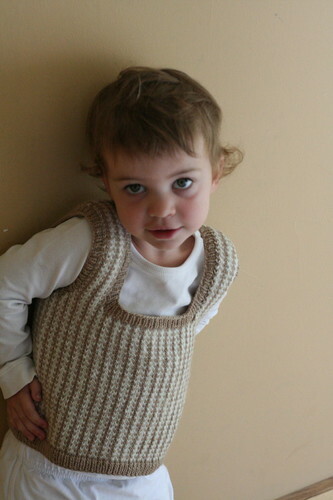 Since wooly vests do not mix well with the heat of summer, I told her she could wear it to school in the fall. We call it her back-to-school vest (or more accurately, her ‘to-school’ vest). It is still far too hot to wear to school, but she waits patiently! I said there would be some baby stashbusting projects to come, so bear with me! I had quite a bit of yarn left from my Pod of Cetaceans cardigan last winter. Not knowing what else to do with it, I set out to use it up in baby projects. Sadly, I do not feel very excited about the prospect of baby knitting this time around. 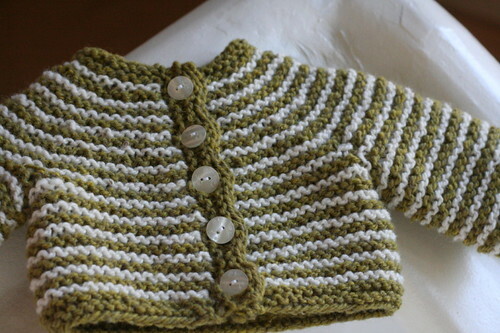 If I must knit a few baby items, let me use great yarn! I love everything about New England Highland: the weight, the spin, the tweediness, and the wonderful color saturation. 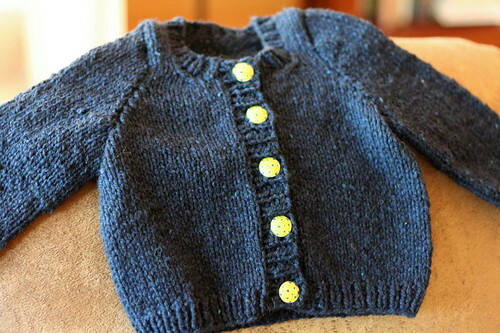 Earlier this summer, I found the most perfect buttons to match this navy blue yarn. Unfortunately, the lime green proves difficult to photograph against the navy background! 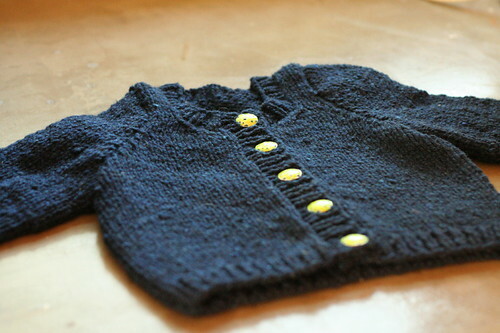 I did not use a pattern for this cardigan, only some basic measurements. I cut it pretty close with the yarn on the second sweater, coming out with only scraps remaining. 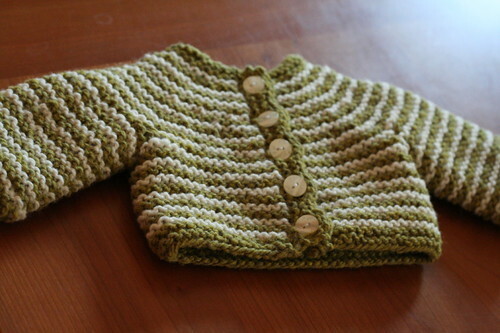 Again, I did not use a pattern for this one, just measurements. I think there were four decrease rows in the yoke. I promise there will be a break from baby and child knitting! I intend to publish two new patterns in October, both for adults! Stay tuned! It looks like Beatrix is doing ‘I’m a little teapot’ in the photos… is she? She’s SO cute! the vest is very cute, too. I could totally see making one for my son. So much designing goodness going on over here! I can’t wait for more. 😀 Way to go! Very cut vest and model! It is added to my favourites already. 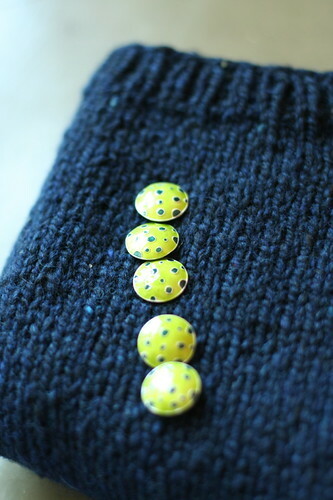 And love the lime green buttons, so pretty! 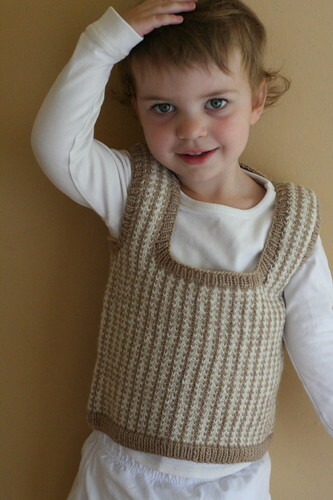 Adorable model and pattern! Where did you get the buttons for the navy sweater? They are fantastic! Oh my goodness!!! she gets cuter and cuter everyday….lovely! omg. could Beatrix be any cuter? I don’t think so. The vest is definitely a winner; but, B is definitely a keeper! She is so adorable!